Description: Oh no, what an accident! Tomoko's lovely phone got broken when she dropped it. Let's help her fix it! Carefully clean her phone, then replace the screen by opening up the phone and adding in the new glass. Then it's time to have fun decorating. 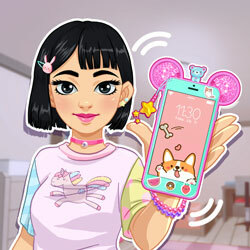 Choose a color for the phone, add some kawaii accessories and turn the phone on either side to choose your favorite case for it. So cute!